Times are changing with the rapid development of all sorts of technology, that in some ways are / or will affect the way we live our lives, and conduct our business. In response to the overwhelming amount of internet purchasing that is occurring not only nationally, but locally as well, the McCracken County Sheriff's Department has implemented a program that simply required a safe place to be provided for area residents to meet, and conduct the transaction, regardless if you are the buyer or the seller. When purchasing items from someone that is on the internet and it requires for you to meet that person somewhere, that is the part of the transaction that gives many people pause. You do not know the person that you are about to meet, and they often times do not know you. Although nothing has been reported locally, nationally there have been instances of people getting robbed or worse, when meeting, and often times the places that people will meet aren't necessarily in a public place, or for that matter a safe place. 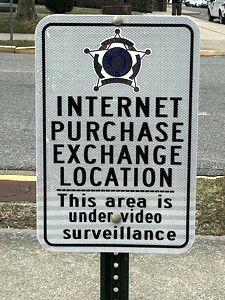 A designated "Internet Purchase Exchange Location" has been established at the McCracken County courthouse parking lot which is located next to the designated vehicle inspection lanes. This area is covered under video surveillance that is recorded day and night. There is also an almost constant law enforcement presence at this location, day and night. Another plus to the implementation of this program is that the cost was extremely minimal. Existing resources were utilized, and McCracken County Road Department made the sign in their sign shop. We hope that this location will provide everyone with a little "peace of mind" when it comes to meeting the person that you are buying from or selling to, and knowing that there is a safe place to do so.